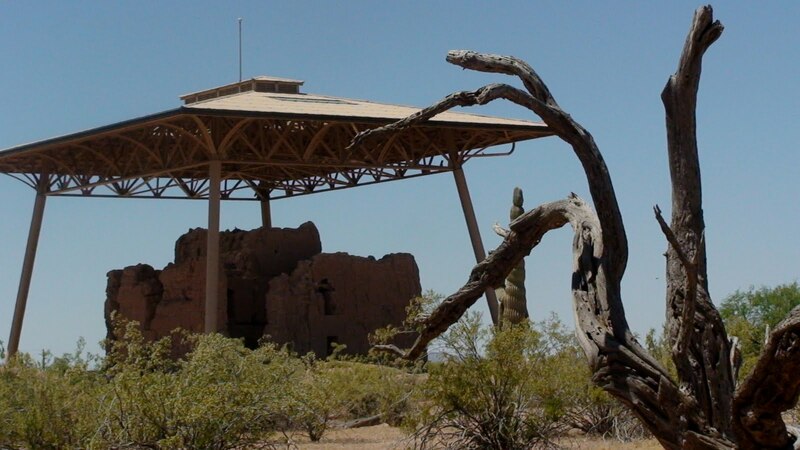 The ruins of Casa Grande is a large structure of remains of the Hohokam culture that lasted about 1000 years. When this structure was visited by Father Eusebio Kino in 1694, it had been abandoned since around 1450. Father Kino's entries into his journal were the first written record of the site, since the Hohokam themselves left no written records. Oral tradition and archaeological evidence lead to the belief they are the ancestors of the Akimel O'Odham (Pima) and Tohono O'Odham Indians. The Hohokam were spread across the Gila and Salt Rivers and engaged in extensive irrigation farming and wide spread trade, disappearing in the mid 1400s. What remains is this large structure, the apex of their architecture, with holes in three of the walls indicating it was used for astronomical purposes. It is built with caliche with walls at the base 4 1/2 feet thick. The building was at the center of the largest community of villages located between two of their large canals. This site was for observing the movement of celestial objects to be aware of seasons for planting, harvesting as well as other significant events. 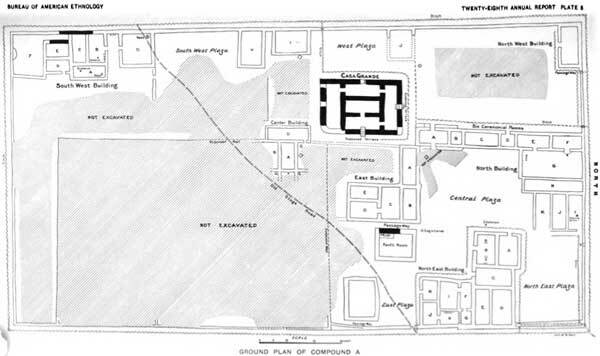 The compound contains a ball court, pithouses surrounded by central plazas and platform mounds enclosed by walls. 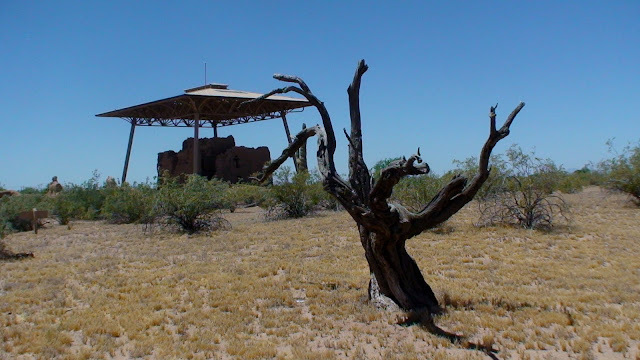 This was a special structure for these desert dwellers. 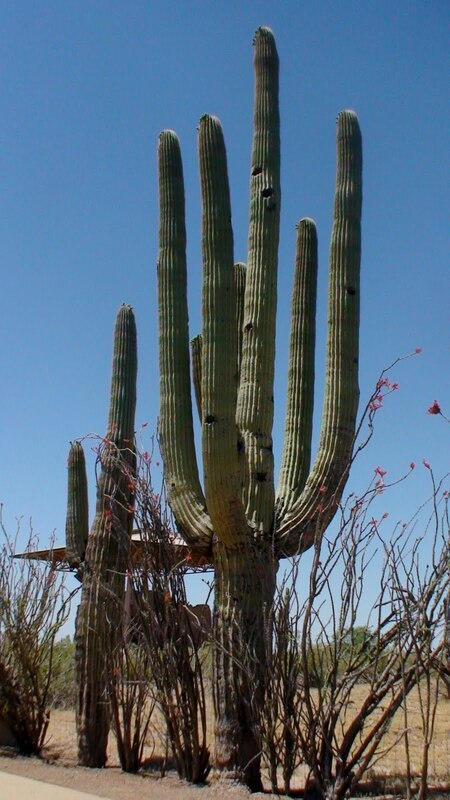 Located in the northern part of the Sonoran desert, the people of this civilization were also hunters and gatherers as well as farmers and are considered the first people to have learned how to live in the American Desert. They were dependent on a developed irrigation system and what happened to them is not fully known. The water cycles of the rivers of the desert lend themselves to flooding and periods of dryness. It appears that high water damaged their irrigation systems and coupled with dry periods, the water wasn't able flow high enough in the canals to be distributed among the communities and farming fields, causing them to abandon their communities. Those that remained stayed in small settlements and probably became what are now the O'Odham peoples. Construction to preserve the ruins started in the 1930s, beginning with the steel shelter roof and the main part of what is now the visitor center, which was completed in 1932. The Civilian Conservation Corps built small adobe buildings between 1937 and 1940 that are still in use today.